**Nicholas Flamel appeared in J.K. Rowling’s Harry Potter—but did you know he really lived? And he might still be alive today! 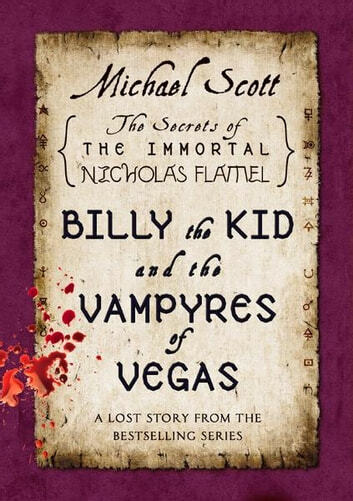 **Discover the truth in Michael Scott’s New York Times bestselling series the Secrets of the Immortal Nicholas Flamel with Billy the Kid and the Vampyres of Vegas, an ebook original. Years before Sophie and Josh Newman met Nicholas Flamel, two legendary warriors fought together for the first time. Billy the Kid and Scathach the Shadow. Now that lost story can be told . . .
Billy the Kid is immortal. And being immortal means following unpredictable paths. 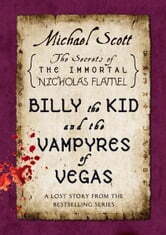 With this exclusive eBook, Michael Scott offers readers a never-before-seen short story from the world of the bestselling series the Secrets of the Immortal Nicholas Flamel: the tale of how Billy the Kid and Scathach meet for the first time and join forces against the unseen, deadly and eternally hungry vampyres who control the city of Las Vegas—where Scathach must face her greatest fear. I thought it was very good I hope Michael Scott makes more books of Billy the kid and Scatty working together, I just wish it was longer!! Too short but a great tid bit to keep you wanting more until the next series comes out! Wasnt there a Nicolas Flamel in harry potter ?Weird using the same person in two difrent books.I geus this one might be better.